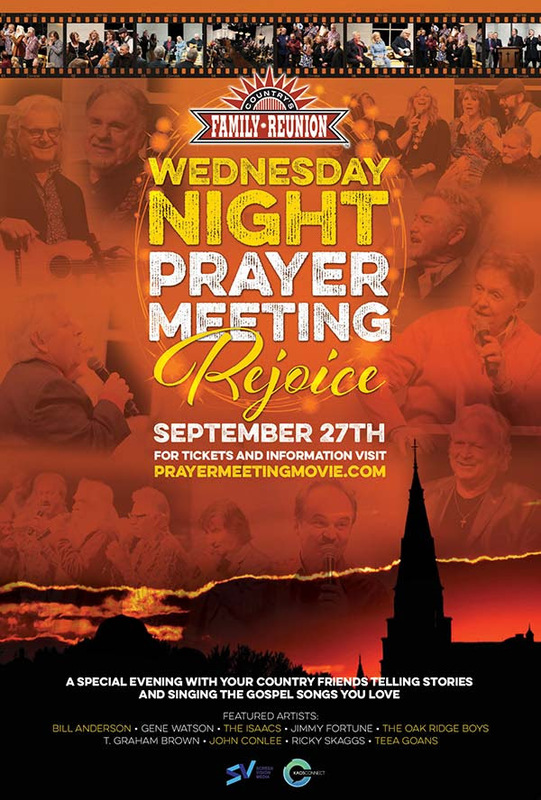 NASHVILLE, Tenn. – Gabriel Communications, creators of "Larry’s Country Diner," in association with KAOS Connect and Screenvision Media today announced the first-ever movie theatre premiere of 'Wednesday Night Prayer Meeting: Rejoice!' This let-your-hair-down style of worship will feature interviews and performances by Ricky Skaggs, Oak Ridge Boys, Larry Gatlin and The Gatlin Brothers, Gene Watson, John Conlee, Teea Goans, Jimmy Fortune and the Isaacs in a 90 minute theatre event celebration. Tickets are available at www.prayermeetingmovie.com. “Screenvision Media is proud to bring to movie theatres this family friendly, heart-warming celebration of intimate stories and performances by so many legendary country music artists of our time. 'Wednesday Night Prayer Meeting: Rejoice', is one not to be missed,” said Bernadette McCabe, Senior Vice President, Business Strategy, Screenvision Media.